They DID NOT choose their religion. They were brain-washed into it. Religion is a matter of geography. Religion is a matter of the family you were born into. THINK! 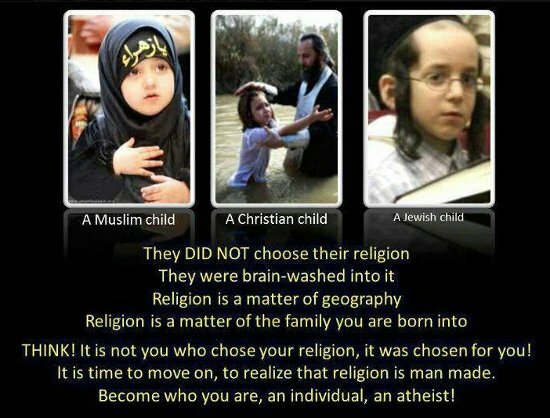 It is not you who chose your religion, it was chosen for you! It is time to move on, to realize that religion is man made. Become who you are, an individual, an atheist! Disclaimer: This is a rant. This isn’t what I normally post here as a “meditation.” Frankly, I’m getting a little tired of being pushed around by a bunch of folks on the web who think they can take an image, manipulate it with some text, and use it to complain about how bad religion is. Today, I decided to push back. I first saw this bit of Internet meme “shared” by a Facebook friend and a person I’ve known for many years. He’s a person I hold in high regard but we obviously have different viewpoints on religion. If I had seen this coming from almost anyone else, I would have ignored it, but I consider this person an actual friend, so naturally, it hurts. I turn 58 tomorrow. I didn’t become a Christian until I was over 40. I used to be an atheist, primarily because the prevailing culture around me was atheist and it seemed to make sense at the time. Then I started thinking for myself. Why would I let the culture around me choose my religion and my identity for me? Why would I let an Internet meme choose my identity for me? And what have I ever done to you that you should try to change my identity into what you think would be better for me? I’m not trying to change you. It occurs to me that all cultures and people groups have their various values and customs that are passed on from one generation to another. Most liberal progressives don’t complain about cultural diversity, even if it radically differs from their own, because they recognize that people have the right to observe their native customs and certainly, in the vast majority of cases, liberal progressives and atheists don’t demand that other people groups who are not white, middle-class Americans, change their ways just because they are different than the white, middle-class American atheist’s ways. Islam and Judaism are closely tied to national, ethnic, cultural, and racial identity. Why isn’t is considered racism, prejudice, and bigotry for you to demand that Jews and Arabs refrain from passing on their values and beliefs to their children? Are you (the general “you”…not naming anyone specifically) more equipped to tell the rest of the world to live your lifestyle? Don’t you pass on your values (atheism, progressive liberalism) to your children? Why are you trying to control everyone else in the world? Jim, if you had been born in Saudi Arabia and were atheist, assuming you survived to 40, the odds are more likely you would have become Muslim. This isn’t really about an Internet meme, but an historical fact. It exited loooooong before the Internet. 99% of people grow up believing what their parents did. Why did none of the natives in the Americas become Christian for 1500 year. That you decided to for a different belief system than your environment does not alter the facts. You are an exception. I can see his point, but I think he (and a lot of people like him) are missing something. In making statements and posting photos such as the one I put at the top of this blog post, aren’t atheists trying to say that their viewpoint, lifestyle, and values system is superior to everyone else’s? I know that many religions, particularly Christianity, are accused of exactly the same thing and I know from personal experience (having once been an agnostic leaning toward atheism) that having to listen to a Christian evangelist can be really annoying. But what about all that “diversity” stuff? If progressive liberalism and atheism supports generally being accepting of racial, cultural and ethnic diversity, then isn’t complaining about how different ethnic, cultural, and racial groups choose to raise their children and pass on their values a type of bigotry? While Christianity isn’t tied to a particular nationality, race, ethnicity, or culture, Islam and Judaism certainly are. How can the comments espoused by this group of people be seen as anything but prejudiced and even racist? Yes, I’m coming on strong. Yes, today I’ve decided to feed the trolls. But it seems like everyone is supposed to have rights to this, that, and the other thing in this world…except religious people. Not only is this group of atheists guilty of the same acts they say religion commits: exclusivism and rejection of the values and lifestyles of other people groups, but they’re also guilty of what the rest of the world sees Americans as doing: attempting to spread our own values and lifestyle to the rest of the world and using our own cultural lens to judge the right and the wrong of other people, cultures, and nations. How are these atheists any more morally correct than any religious person? How does complaining about religious people make the world a better place? What do you gain by “going after” Muslims, Jews, and Christians? Do you plan on taking on Buddhists and Wiccans next? Has the Dalai Lama somehow offended you? If you really want to spend your time and energy being useful and helping others, please step away from the computer and actually do something for another human being. Volunteer at a homeless shelter. Give cans of food to the local food bank. Spend an hour picking up trash in the parking lot of your neighborhood park. Hold the door open at a public building such as the library for a disabled person or a single mother who is trying to manage five children. Heck, just smile at a stranger once in a while because it’s the right thing to do. Don’t complain about me or people like me, saying we’re the problem. Go out into the world and be the solution. If you do that, the problems will take care of themselves. Signed, a fellow human being, who has volunteered, donated, picked up trash, held doors open, and who smiles occasionally at strangers. hey, didn’t Obama say the same thing? Err…No…He said that if you are a business owner…..
“it was chosen for you! It is time to move on”………….My faith was not chosen for me by anyone… I was born in to a family of NO faith. G-d however chose to find me. There are probably a lot of atheists in the world who sincerely believe their is no God and otherwise do not dislike, hate, or object to the vast majority of religious people who do believe in something larger than the human race. And then there are those people and groups who, for whatever reason, have “issues” with religion and use atheism as a shield and a sword with which to defend themselves against perceived attacks from religion and to attack religious people on a variety of levels. 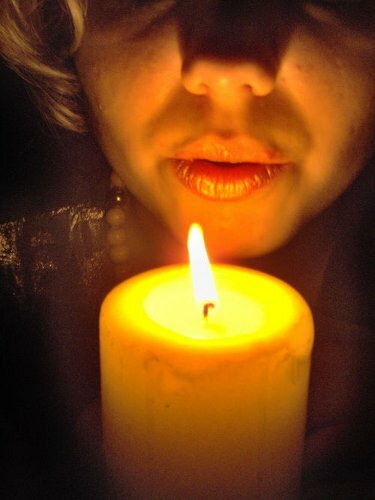 Some come from religious families or backgrounds that were very abusive and they have responded to hurt with anger. I don’t require that they accept my beliefs as their own. It is only a shame that they cannot allow us the relationship with God and the spirituality and wonder that they themselves cannot perceive. Jim, as the perpetrator I wish to again publically apologize. It was not my intention to hurt you in any way with that post. I not only have a great respect for you professionally and personally, I have found your religious posts and comments fascinating and thought-provoking. In retrospect, the image text was somewhat arrogant with it’s implication that atheism is the only way to think. While I am appalled at the incredible ignorance that some people have about their own religion and simply spout off what daddy or their pastor told them, there are a number of Christians authors I enjoy reading (including yourself). Everyone has the right to their own beliefs and practices so long as they do not interfere with others, and insisting someone change their beliefs is denying them that right. First of all, it is extremely gracious of you to say that. I really appreciate it. I know you to be a kind and generous person, which is why the image you posted to Facebook seems like such a glaring contradiction. From my point of view, each person has to negotiate their own relationship with God. It is true that some folks are raised in a religious home but at some point, you can’t depend on Mommy and Daddy’s faith to support your own. Either it has to be something that you own completely or you need to look somewhere else. My parents took me to church when I was young but it was nothing I personally believed in. The minute I was old enough to say “no” and not go to church, I stopped. I know it hurt my mother a lot when I told her I didn’t believe in God, but it was something I needed to do for me. It was probably 25 or more years before I stepped back into a church as a form of worship of any kind. I agree that there are a lot of “religious robots” out there who “quote chapter and verse” but don’t know what it all means. There are also a lot of believers who are great at putting other people down, but who’ve never committed a single act of charity in their lives. If you’re going to be a “religious person” you need to constantly be immersed in investigating your own belief system as well as living out the finest aspects of it, which in my case, includes charity, compassion, and even a sense of wonder. The only thing I ask of atheists and progressive humanists is to do the same. I’ve met more than a few atheists who believe what they believe because the majority of their friends and the culture around them support the same viewpoint. If you’re going to be an atheist and believe in a relativistic morality, know what you’re doing and why. If inclusiveness is part of your belief system, don’t systematically exclude others just because they’re religious. Again, thank you for coming by and saying what you said, Jim. It takes a lot of grace to address a dialogue like this one.